Best Yet: OS 4.7.0.90 Leaked for the Storm 9530 & 9500! So long .86! 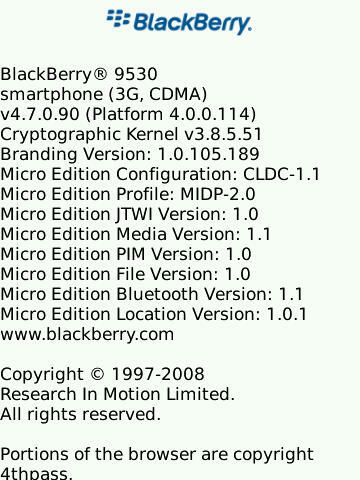 Another week, another leaked OS for the BlackBerry Storm. Can I hear a w00t?! A helpful friend put OS 4.7.0.90 into the wild for the both the BlackBerry Storm 9530 and 9500 and the initial impressions from this unofficial release are that it is yet one more step in the right direction... as in probably worth installing. You'll want to check the CrackBerry forums threads on it for all the details. It sounds like it's mainly all good, minus some minor camera bugs, but every tid bit of what's good and bad is sure to pop up in the hours/days ahead so keep your eyes on the forums. Keep in mind this is NOT an official release, so install at your own risk and only if you're comfortable with doing so. If you've never installed an OS beta before be sure to dive into the CrackBerry forums and read all of our tutorials. Keep in mind that these leaked OS's sometimes take a step backwards in one area while making a leap forward in another. If you're on the fence, you're best off waiting until the 9530 4.7.0.90 Discussion & Findings thread and 9500 4.7.0.90 Discussion & Findings thread fills up with some data. You can also visit these threads for links to more download sites in case you find the links below slow. Enjoy! !